Unlock your HTC with doctorSIM quick and easy. 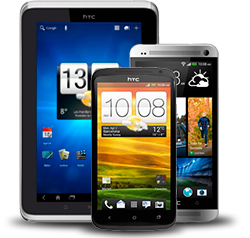 Legally unlock your HTC online without leaving home. Valid for all HTC models. How to unlock my HTC phone with doctorSIM? Once you've requested an unlock code for your HTC through doctorSIM, we'll send you simple step-by-step instructions on how to complete the process. Turn on your phone, type in the unlock code you received via e-mail and your HTC will be permanently unlocked. That's all there is to it! How many unlocking attempts does an HTC phone have? You have an infinite amount of attempts to unlock your HTC as this make doesn't have this particular restriction. Nonetheless, the unlock code you'll receive from doctorSIM will work the first time. Do I need to know the network my HTC is locked to in order to unlock it? No, you do not need to know the original operator of an HTC cell phone to unlock it but feel free to use our HTC phone carrier finder in case you need to know for another reason. Will I lose the phone's warranty if I unlock it? Will it damage my HTC? Unlocking your HTC will neither void the warranty of the phone nor damage it in any way. Our method is recommended by the phone manufacturers and network providers themselves as it won't harm the cell phone's hardware or software. Your HTC will remain unaltered throughout the entire unlocking process. How do I find out if an HTC device has been blacklisted? If you suspect your cell phone has been blacklisted due to theft, loss or non-payment, we recommend using our phone IMEI check service to eliminate any doubts you may have. This is an additional security measure which is not eliminated unlocking the phone and can only be removed by the network carrier. How long will it take to unlock my HTC phone? The guaranteed delivery time depends on the country and network provider selected. However, we will try to send the unlock code and instructions to you as soon as possible. Once you have filled in the information required to unlock your HTC, you will also be able to see the average delivery time of the service selected. Is the unlocking permanent? What happens if the device prompts for the unlock code in the future? doctorSIM's unlocking method via IMEI is permanent. The phone will never re-lock even if you restore your HTC to factory settings. In the exceptional case the phone prompts for the unlock code again, simply retype it as the code never expires. How can I pay to unlock my HTC device? The multiple payment methods available per country are listed in Step 3 of the request process: PayPal, debit or credit card, Apple Pay, cryptocurrencies (Bitcoin, Ethereum or Litecoin), etc. Get more information on doctorSIM's payment methods. The Internet's number one network unlocking company. You will be able to use your HTC with any network carrier. The cell phone's warranty will remain intact. Choose from multiple 100% secure payment options. Legally and permanently unlock your cell phone from home. Step-by-step unlocking instructions by e-mail.